When my wife and I got our first dog (Those are her pics above), I have to admit that we cheated a bit and picked up the puppy a little early. 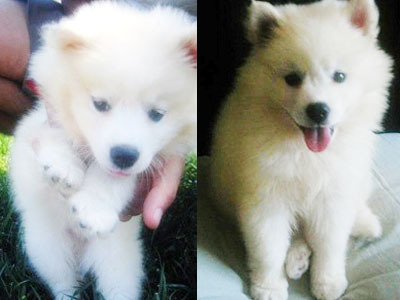 I think we got our little American Eskimo at about 8 weeks of age. It honestly might have been a week earlier. The only reason I bring that up is because we had to deal with a bit of separation anxiety and there are still remnants of that in our dog’s (Nikki) behavior. I have read that after seven weeks it is fine to separate a puppy for a mother but 8-10 weeks is more ideal because the don’t tend to develop some clingy behavior and have issues when mom and dad leave. In our case, even if it was 8 weeks, I think that’s a bit too early. 1 – Crying and barking when either my wife or I left. This would happen regardless of whether or not one of us was still there. Whatever the case may be, if you can’t resist bringing home your dog a little later, be prepared for some issues. I highly recommend just taking that extra couple of weeks to read up on training, puppy proof your house, or just enjoy being alone. You don’t want to create unnecessary stress for your little puppy and that stress may very well last a lifetime.